May 28, 2010 - Happy Memorial Day Weekend!! Be safe! We will catch you on the flipside. Then it is on to our annual Martha's Vineyard trip. Still could use some more rain. The t-storm hype for Thursday never really panned out. Streams are getting or are low! NE PA especially. 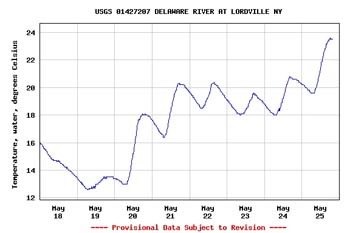 Here we are heading into late-May and the temps at Lordville on the Main Stem of the Delaware are screaming upward. Seems like this has been more the norm rather than the exception the last handful of years. Things will only get worse in the coming days for the water temperatures as we are looking at a few days of hot weather. Fortunately this will be short lived, but if we don't get some rain, high water temps might be something of a longer duration. This is really bad timing since we are heading into the Memorial Day Weekend, which is traditionally big one for fly anglers to flock to the Delaware. You'd think by now that the agencies tasked with managing the Delaware would have figured out to avoid this sort of high water temperature scenario in late-May by now. Penns fished well over the weekend. But if you were fishing sub-surface, the fishing was more technical than usual. 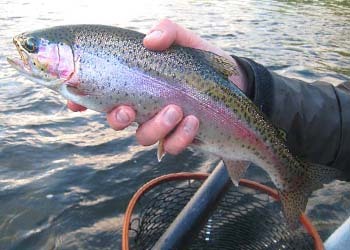 The very subtle takes required an extremely tight line to your fly. You also needed a quick hook set or you missed the fish. No long line nymphing or slow hook sets or it was over in an instant. For nymphing action, the earlier in the day, the better. Gotta get out of bed early! Once the sun got on the water, the action shut down soon after. Not to mention that is also when masses descended on the stream. The rig that produced included a combination of a stone fly and a caddis pupa dropper. In the eve, the grey foxes appeared around 7pm which brought up the fish. Until then they were sleeping though the bright sun! Then about a half hour before dark sulphurs came off in big numbers! However, the fish were keying in on the emergers stuck in the film. Overall the fishing was good, but the water is getting low. Need rain! Floated the Lehighton to Bowmanstown stretch for the first time this year, and just like other sections of the River that we've been on, it fished well. 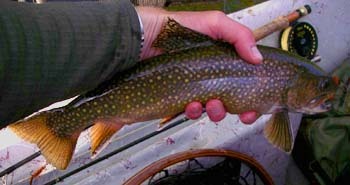 Highlight of the day was getting into a large brookie. Biggest I've witnessed coming out of the Lehigh. It smacked a wolley bugger on a heavy/hard seam. We also managed to tag a few bows and browns on wet flies and drys. The hatch never got too heavy but in the flatter sections the fish were looking up. Looking forward to getting back out! Saturday was just out of control with the wind. I don't think anyone can argue that. Canceling the outing certainly crossed the mind. Fortunately we did not, because someone told the bugs to hatch and the fish to rise. Who would have thought that the windiest day we've ever spent on the Lehigh would coincide with on one of the heaviest (if not the heaviest!) hatches we've ever seen?! The bug situation was really a mixed bag. Hatching included what mainly appeared to be grey foxes, epeorus vitreus species sulphurs along with a few sulphurs (ephemerellas). However, color, and size, really did not matter too much. What was really the key was just getting the fly out there, along with a decent presentation. Which at times was impossible/futile.. Seriously, the only way to describe the hatch was blanket. Even the little ducklings were eating up the mayflies like candy. Much to the distraught of the mother duck who did like how far off the little ones were straying to eat all the snacks. Quite the day! Also saw an eagle. May 4, 2010 - The Worst! 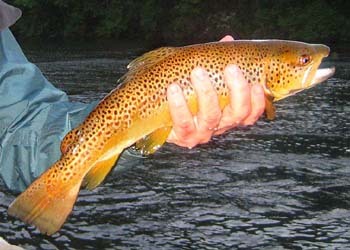 This year, so far, has been the flat out worst for fisherman on the Lehigh when it comes to releases! 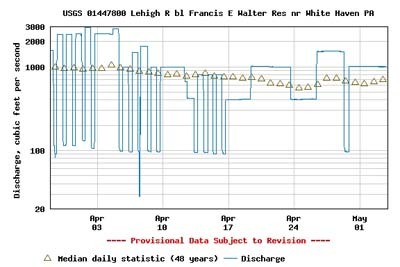 If it was not for the two weekends of assigned 'fisherman friendly' releases in April (400cfs), then anything remotely considered an 'angling opportunity' on the Lehigh would not have happened. Unfortunately, a lot of this inconsistancy/higher releases stem from the concrete work that needed to be performed at Walter. Take a look at the chart to the right of right of releases since April 1, and you can see Walter has been dumping 1,000cfs or more pretty much non-stop. This does not make it easy for the wade angler to fish the Lehigh at all. And on top of this it was being yo-yo'ed all over the place which is not good for the fish. Unhappy fish, make for unhappy anglers. Fortunately this work is done (we think), so hopefully we can get back to a more normal release regime. The other issue with all these high releases is the blow-out of the colder water. Remember, Walter can only push water from the bottom. The result could very well be a short season as a result of a lack of colder water. And while were at it, we have the potential for super heated water, with no protection for the fishery come August, when the stacked whitewater releases come into play. Great! To us though, so far this season, it looks like we've had nothing but one long white water release! Managed to make a run up to the West Branch of the Delaware over the weekend for a few hours of fishing on both Saturday and Sunday. Along with the big-time crowds was some big-time heat! Boy, was it hot - - temperature wise. Too hot, too early! As far as the fishing, it was pretty good, but you did have to work for them. So what else is new when it comes to the Upper D system. 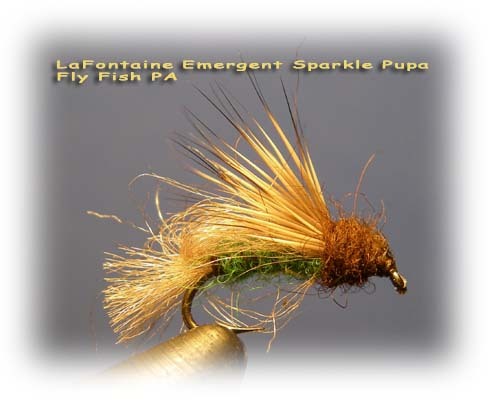 Hot patterns were the good ole red brown spinner, along with the Lafontaine caddis emerger. These two patterns flat out produce on the West Branch. Don't leave home without them. When we found the hendricksons popping - - they began about 3pm - - a comparadun imitation did a good job getting fish to look up. Though we just could not stick them consistently. The ones we did stick were hot fish! Full-on freak-out mode immediately after the hook set made for keeping them hooked extremely difficult. Rainbows especially. As the sun went down, and some spinners began to coat the water, the fishing became easier. Overall the fishing should continue to be good on this system. 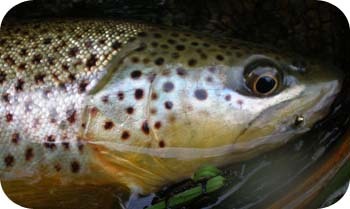 The hendricksons are probably about over, but soon the sulphurs will be here along with more caddis.